On the occasion of ANUGA, the Pan-Hellenic Association of Processors Packers- Exporters of Table olives (PEMETE), presented the ‘OLIVE YOU’ campaign in Germany. This is the three-year promotional program PEMETE, co-financed by the European Union, aimed at informing consumers and professionals about the quality, variety, taste characteristics and benefits of European table olives, increasing demand and developing awareness in the non-productive countries of the European Zone. ANUGA is one of the world’s leading international food & beverages trade fair exhibitions. During this year’s event, there were 165,000 visitors from 198 countries, with 7,400 exhibitors from 107 different countries. 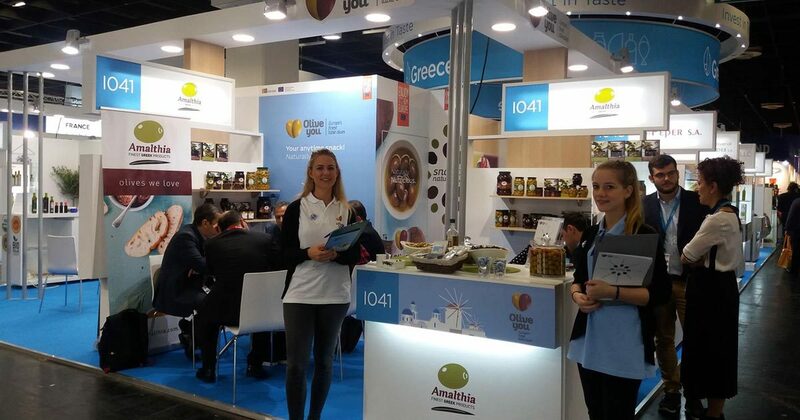 Greece had the sixth-highest level of participation with more than 200 outward-looking companies exhibiting a wide variety of quality foods. The PEMETE’s ‘Olive You’ pavilion enhanced the profile of European table olives by attracting more than 20,000 food professionals. Visitors had the opportunity to taste multiple European table olives varieties – Halkidiki, Kalamata, Konservolia and others. They also learned about new commercial types and packages. The ‘Olive You’ promotional team gave away informational brochures for the most popular European table olives varieties, ‘Olive You’ pins and product samples. The team gathered valuable market and consumer information from questionnaires (written in English and German) gathered from many of the visitors asking about their consumption preferences. The goals of ‘Olive You’ campaign at Anuga 2017 were achieved. Visitor awareness was increases and business meetings (B2B events) were successfully organized, which lead to the conclusion of new commercial agreements. The three-year campaign ‘OLIVE YOU’ in European countries, will reach out to journalists, chefs, distributors, retailers and consumers of all ages, through advertising and promotions, events, samplings, publicity measures, and taste panels with a view to further teaching the public, opinion makers and professionals about the olive’s nutritional value, use in local cuisines, natural advantages (olives’ natural ripening on the tree) and commercial benefits. ‘OLIVE YOU’, the three-year promotional program of PEMETE, co-financed by the European Union, aimed at informing consumers and professionals about the quality, variety, taste characteristics and benefits of European table olives, increasing demand and developing awareness in the non-productive countries of the European Zone. PEMETE is a professional association, founded in 1970, promoting the table olives Greek processing, packaging- exporting companies ‘interests, in accordance with the existing Food Safety Regulation 852/2004. PEMETE’ s 46 members, represented more than 90% of Greece’s exports of some outstanding and unique natural Greek table olive varieties, such as “Konservolia”, “Chalkidiki”, “Kalamata”, and furthermore, small quantities of “Throuba” and “Megaritiki” varieties are included in their product range to more than 100 countries.